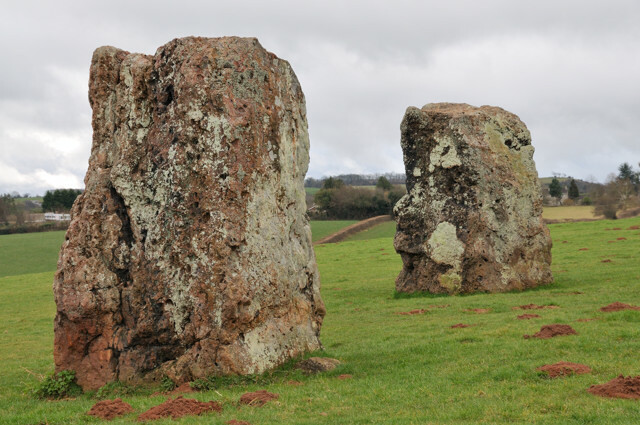 In a farmers field in the village of Stanton Drew, 6 miles south of Bristol there are three stone circles, two stone avenues, a cove of stones and an outlier at Stanton Drew. The name Stanton is derived from the Angle-Saxon 'stan' meaning stone, and 'tun' meaning farm. The stone circles were shown on early maps with the title 'the weddings'. 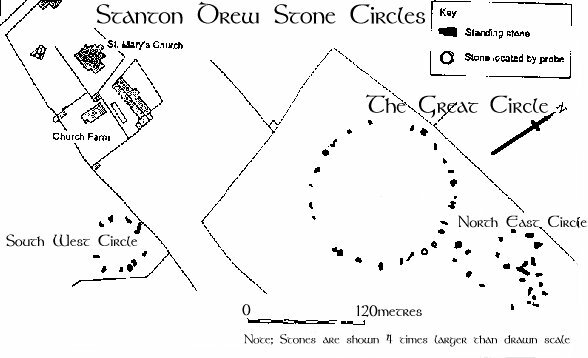 The Great Circle at Stanton Drew is the second largest stone circle in England and has 27 of the original 30 stones which is 112m (368ft) in diameter. An avenue extends to the north east of the Great Circle towards the River Chew and a second avenue meets it from the north eastern stone circle. It is also the largest known timber circle site, but no markers exist. Beside it lies the impressive North-East Ring, 8 or 9 very large stones, out of 10 originally, measuring 29.6m (97ft) across, four are still standing. Shown in the picture above, with great ring beyond. The South-West Ring, 40 metres across with 12 stones surviving is in another field nearby and is badly ruined. From both the Great and North-East circles there are two short avenues running north-eastwards towards the River Chew. The avenue starting from the North-East Ring, has seven surviving stones. In the garden of the village pub, The Druids Arms, is the Cove, which consists of two upright stones and a slab lying between them. This is in a straight line with the centres of the two accessible stone circles. The Outlier, also known as Hautville's Quoit, is to the north of the circles, across the River Chew. It is a sandstone boulder, now recumbent, and it is in a straight line with the centres of the Great Circle and the South-West Ring. Their alignments and proximity would suggest that these sites were related as a single complex and it is a fair assumption that Stanton Drew was very significant during the later Stone Age. Very little is known about the site and the stones. Perhaps because of their location, a bit off the beaten track, they have not taken on a significance like Stonehenge or Avebury. No excavations have been recorded but it is believed to be the same age as Avebury, and neither have any modern survey's been made until recently when a Geophysical Survey was carried out by English Heritage. As well as showing better, the position of some of the stones which are no longer on the surface, they also discovered post-hole rings inside the main circle. They indicate that once there was a massive timber henge or building here. It has nine concentric rings of what look like postholes, each about three feet wide. The outermost ring is more than 300 feet in diameter, filling most of the area within the Great Circle, while the innermost ring is about 75 feet across. All told, there were probably between 400 and 500 posts. Beyond the stones the magnetometer located an encircling ditch, no longer visible, about 23 feet wide and almost 450 feet in diameter. The south west circle also had 3 rings of post holes running within it. The site is suggested to be aligned on the river, and at some times of the year this floods and then often the river runs red, with clay leaching into it. The great circle has its own magnetic field, and this can be seen using a compass, this has led some to believe that these monuments were more than observatories but did something with, or was connected with, energy flow. At the time they were built the magnetic effects of the earth would have been many times stronger than they are today. Many also report this ring having one of the strongest effects on dowsing rods, these are not made of magnetic responsive material so not in theory simply affected by the magnetic field that has been created. On one visit, there were no other visitors at first, but we were closely followed by a couple from Holland and as we were leaving another car pulled up by the side of us. It was a very interesting site to see and worth a visit if you like stone circles, you will not be disappointed. On our latest visit we saw no one else. This is probably the finest stone rings in Britain, so near a major city, far more complete and original but known by fewer people. Although there is not much recorded evidence of them, they are thought to have been first noted by an antiquarian called John Aubrey in 1664. However the first plan of them was not published until 1776 by William Stukeley. Very little is known about the site and in it's absence folklore has been allowed to grow up around them. The most persistent tale is that of a Wedding Party. Where it is said that the stone circles and cove are the petrified remains of a wedding party turned to stone by the Devil for dancing on the Sabbath. The cove is supposed to represent the parson and bride and groom with the other circles being the remains of the guests. The story goes that one Saturday, a long time ago, there was a wedding feast on the site of the existing circles and everybody who attended was having a good time. When the clock struck midnight the fiddler refused to play anymore because it was Sunday. The bride was not having any of this and insisted the party would go on even if she had to find another fiddler. A tall dark man with a fiddle appeared and struck up a tune. He played faster and faster and the guests were compelled to keep going. This apparently went on all night until the early hours of the morning when the group had turned to stone and the Devil had disappeared with their souls. Of course there had to be one survivor of this tale for it to have been told in the first place, and it is said that the original fiddler was found that Sunday morning cowering in the field with fright after what he had seen happen the night before. Similar Sunday observance stories relate to many stone circles, put about when the fear of God was widely taught by Christians. A second tradition is that the stones are uncountable. It is said that anybody who tried to count the stones would either die on the sport or become ill soon afterwards. (I have found no record of this though). It is often said that Stanton Drew was lucky, being tucked away from public gaze it was not subject to the same vandalism from Christian groups as some other lowland monuments, it is largely complete, the finest original example that we have, and with some features still functioning. While with Avebury for example many of the stones were destroyed and others buried and it was only in the 1930's that it was restored and many stones put back. There is no such record of any similar restoration at Stanton Drew. 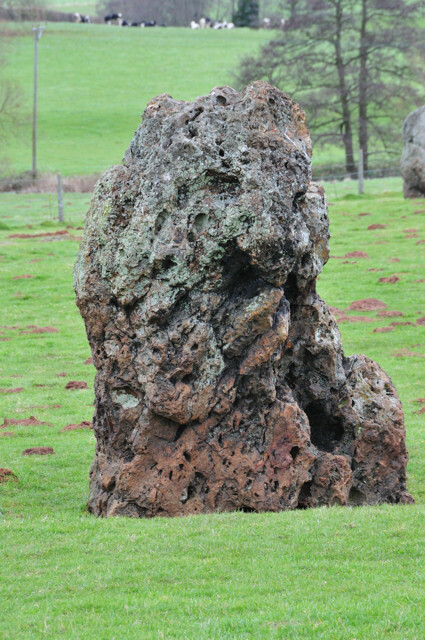 So how can we explain that when Aubrey visited Stanton Drew in the summer of 1664, he recorded that many of the stones had been removed and smashed during the previous few years by farmers wishful of extra land, and was unable to reach the stones because the field was full of ripening corn. So does this mean that there were other circles beyond what we can see now, or could there be another explanation. Dry day, field can get a bit boggy. Off the B3130 towards Stanton Drew village the Stone Circles located to the East, the Cove is in the garden of the Druid's Arms Pub in the centre of the village. You can walk between the two. Circles: From parking the car you walk through a gate (with a donation box) and walk across the farmers fields. Car Park - for the Circles at the end of a small road near the entry gate, for the Cove use the parking area near the pub. Nothing at the Stone Circles, there are refreshments and toilets in the Druid's Arms Pub, but the Cove. 3 Stone circles, across the fields, avenue and more, most stones are standing and the 3 stone cove in the pub's garden. Can do a 360 degree panorama of the stone circles and get them all in shot. Camera, Tripod, panorama kit, grads, wellies or good shoes for the field trip. Be prepared for climbing stiles. Sheep in the fields with the stone circles. Any reasonable time. Entry to field suggests daylight hours. £1 per person in honesty box on entry gate. Special Needs Access: Ground is flat but there are swinging gates, with restricted room, and other obstacles. Stiles to climb. Children Facilities: None specific, but this a safe country environment, no traffic and total visibility. Few if any people, children will love this large site. Dogs Allowed: Sheep in the field, Sign on entry gate saying no dogs allowed.